World Cup boosted sales of big-screen TVs, average prices fell | What Hi-Fi? Perhaps unsurprisingly, the World Cup had a major impact: sales of large TVs got a big boost in May and June, with a third of sets sold in June being 37in or larger. In the three months to end-June 2010, sales of LCD TVs were up 11.6%, plasmas up 14.9% and Blu-ray players up 26.5%, compared to the corresponding period in 2009. To put this growth into some kind of perspective, a total of four million TV sets were sold in the UK in 1990, the figure rising to a massive 10 million sets in 2008. We're a nation of telly lovers, it seems. In the year to June 2010, flatscreen TV sales reached 10,091,000. 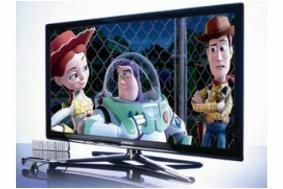 The fledgling 3D TV market racked up sales of 8000 units in May/June. The exact figures were 3784 3D TVs sold in May and 4272 in June. During the same months, sales of 3D Blu-ray players were 1906 and 2798 respectively. While sales of flatscreen TVs have risen, prices have fallen. The average price of a 40-42in flatscreen dropped from £712 in June 2009 to £572 in June 2010, while average 32in prices fell from £430 to £380 and 50-60in screens dropped from £1156 to £943. Other features now coming to the fore include LED backlighting, which accounts for around 40% of the 42-46in TV sector (by value), and web connectivity which is now included on more than 50% (by value) of the 42-46in TVs sold in the second quarter of this year. Sales of Blu-ray players reached £110m in the year to June 2010, with the average price of a BD player dropping to £158 (and as low as £135 in June 2010). As for audio, the increasing popularity of music streaming saw the market for music servers and clients grow to a value of £22m for the year. One of the big growth areas was multichannel amplifiers/receivers, with 103,000 units sold at a value of nearly £50m. The average price was £461. Sales of iPod/MP3 docking stations rose to 2.9 million units for the year, but the biggest growth spurt came from in-ear headphones, with sales of nearly six million units in the year to June. More traditional hi-fi separates fared less well. Sales of CD players were down 18% by volume, and stereo amps fell 17%, but average prices rose to £385 and £337 respectively. Interestingly, £1000+ hi-fi separates (CD players and amps) gained market share at the expense of midrange £500-£1000 models.